In part 2, we saw that adding a volatility filter to a single instrument test did little to improve performance or risk adjusted returns. How will the volatility filter impact a multiple instrument portfolio? In part 3 of the follow up, I will evaluate the impact of the volatility filter on a multiple instrument test. The tests will use nine of the Select Sector SPDR ETFs listed below. *Note the difference in start dates. The volatility filter requires an extra 52 periodsto process the RBrev1 indicator so the test dates are offset by 52 weeks (one year). Both tests will risk 1% of account equity and the stop size is 1 standard deviation. Test #1 is a simple moving average strategy without a volatility filter on a portfolio of the nine sector ETFs mentioned previously. This will be the baseline for comparison of the strategy with the volatility filter. Test #2 will be a simple moving average strategy with a volatility filter on the same 9 ETFs. The volatility filter is the same measure used in Follow-Up Part 2. The volatility filter is simply the 52 period standard deviation of close prices. Buy Rule: Go long if close is greater than the 52 period SMA and the 52 period standard deviation of close prices is less than its median over the last 52 periods. Both strategies perform fairly well. 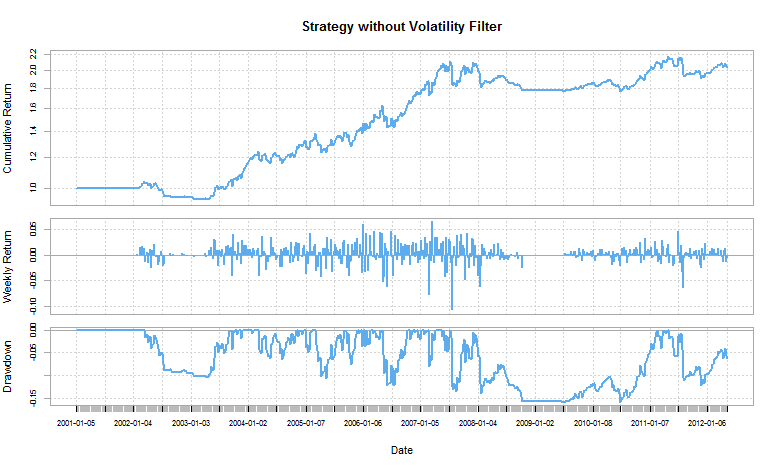 I would give a slight edge to Test#1, the strategy without a volatility filter. 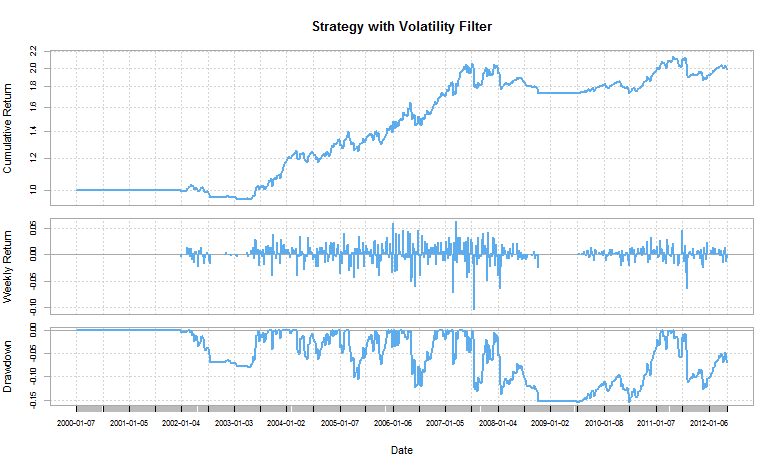 The strategy without a volatility filter has a slightly higher maximum drawdown (MaxDD), but also a higher CAGR. Below I will include the R code for the test#2, shoot me an email if you want the code for test#1. #Function that calculates the n period standard deviation of close prices. #This is used in place of ATR so that I can use only close prices. To leave a comment for the author, please follow the link and comment on their blog: rbresearch » R.